Crabs are ten-footed crustaceans with a soft body hiding under a thick and flat shell, their exoskeleton. Most species have two very large claws and are known to walk side ways. 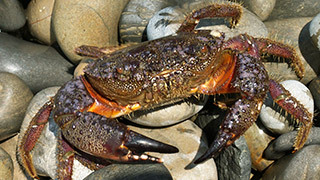 The different species of crabs live on land as well as in fresh or salt water.